Reading boss Brian McDermott wants his players to put their egos to one side in their bid to make the play-offs. The 54-year-old won his first game in charge since returning to the club against Blackburn Rovers 1-0 on Sunday. Danny Williams' goal secured Reading's first win over Blackburn since 1986 and left the 11th-placed Royals four points off the top six in the Championship. "All those egos, we have to put those aside because they are not useful," McDermott told BBC Sport. "It is never about an individual, it is all about the team, it is about everybody. "It is about all of the staff, all the players and the fans to really get behind the boys," added McDermott, after sealing the Royals' first win in five matches. 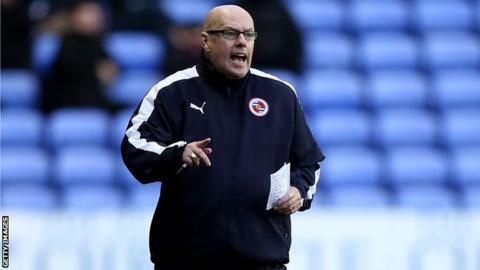 McDermott, who first managed Reading between 2009 and 2013, left a scouting role at Arsenal to return to the Madejski Stadium last week.